“Brush your teeth! Brush your teeth! Did you brush your teeth yet?” Goodness, I can still hear my mother chirping at me. Before school. Before bed. And as much as I loathed it, in the end, mother did know best. Whether we like it or not, we all grasp from a very young age that teeth brushing is important. And we have all likely heard sayings such as,“You don’t have to brush all of your teeth, only the ones you want to keep.” We mostly, however, equate teeth brushing with a mouth full of shiny pearly whites and lack of teeth brushing with, well… the opposite. Turns out oral care, the process by which we clean our mouth, has much bigger impact on our health than just salvaging our teeth. Our oral health – the condition of our teeth, gums, tongue, is not just a cosmetic concern. Poor oral hygiene has been linked to many diseases including stroke, dementia, and pneumonia. A recent Wall Street Journal article highlighted pneumonia as one of the top hospital-acquired infections in America and yet many hospitals and health care facilities probably don’t do enough to fight it. What’s one of the best weapons to prevent pneumonia? A toothbrush. While critically important for vulnerable populations, brushing your teeth is easier said than done for many patients in hospitals like Magee. Patients can have limitations in hand and arm function or even fatigue and pain that make it difficult to brush their teeth by themselves. Good oral care can also have tendency to take a back seat to other urgent priorities being addressed in the hospital. On top of their primary condition, such as stroke or spinal cord injury, patients at Magee typically come to us with a host of other medical conditions, including compromised immune systems. Because of this, it is crucial that oral care is handled as part of the comprehensive treatment plan to reduce their risk for complications such as pneumonia. 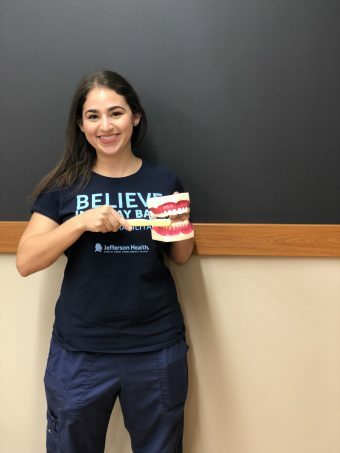 As a Speech-Language Pathologist, I clearly have a particular interest in patients’ mouths as part of my daily therapy, but I am only one member of a multidisciplinary team concerned with oral care at Magee. Each patient at Magee has a guideline for how often they should be obtaining oral care depending on their medical condition and risk of associated complications such as pneumonia. Our goal is to help our patients reduce their risk of these secondary complications so they can focus on what they typically care about the most; their physical and cognitive rehab and recovery. Don’t be shy when it comes to your mouth. Ask for help if you have difficulty brushing your teeth or doing oral care by yourself, or are just uncertain if you are able to do a sufficient job at it. Talk to your doctor, nurse or speech-language pathologist about good oral hygiene practices. Have them screen for potential issues during follow-up visits. Take advantage of electronic toothbrushes. The electronic brushing feature is helpful if you have difficulties moving your hands and arms or if someone is helping you. The ones with timers are guide you to make sure you spend enough time brushing. Floss and clean your gums any way you can. Use a waterpik or the pre-made flossers for ease and convenience! You don’t have to stick to a traditional string of floss. Focus on preventive care. Find a dentist who is accessible to you or your loved one. This can be challenging, but don’t give up on finding a practice that can accommodate your specific disability. Remember, a clean mouth is not just a happy mouth but also a happy body! To learn more about the role of Speech Therapy at Magee, click here.